Mutiny Zine interview with Jonathan, international secretary of the Zabalaza Anarchist Communist Front (ZACF), about the police massacre of workers who were on strike at the Lonmin company’s mines in Marikana in South Africa. 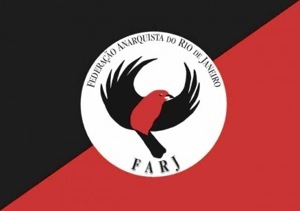 In this interview by Jonathan Payn of the ZACF, realised between August and October 2010, the Anarchist Federation of Rio de Janeiro (Federação Anarquista do Rio de Janeiro – FARJ) talks about its understanding of concepts such as especifismo, organisational dualism, social insertion and the role of the anarchist political organisation in relation to social movements and the class struggle. Answers by Michael Schmidt, International Secretary of the Zabalaza Anarchist Communist Front (South Africa) to questions put by Situation, newspaper of Autonomous Action (Russia), December 2008. The interviews were conducted in Johannesburg on 21st of June, 2008 – the day before MDC leader Morgan Tsvangirai announced his decision to not participate in the June 27 presidential election run-off. The ZACF is one of the most active libertarian formations in the southern part of the African continent. In order to better understand its history, its intervention in southern African society and the fights which it impels and supports, we interviewed one of its militants, Michael Schmidt – Alternative Libertaire. An interview done by the British anarchist magazine Black Flag (issue 224). This interview was done collectively by 2 Durban and 2 Johannesburg members of the ZACF.